Each year, Zara churns out a handful of items that just stick with its consumers. Thanks to social media, realizing which items beat out all the rest is actually quite simple due to the overwhelming amount of fashion girls who love Zara. Ahead, we've narrowed down the most popular Zara items of 2018 to nine key pieces. These items were chosen based on the frequency of which we saw said items throughout the year. Whether you remember them on your favorite blogger, in your best friend's closet, or as part of your coworkers' go-to uniform, there's no denying you'll recognize at least one of these pieces. Chances are you probably own a majority of the items listed too. With their barely-there straps and low kitten heel, it's no wonder why these sandals skyrocketed to It status over the summer. Our editor in chief, Kat Collings, wore these strappy sandals all over New York Fashion Week (10 miles, to be exact!) and can personally attest to their surprising comfort levels. 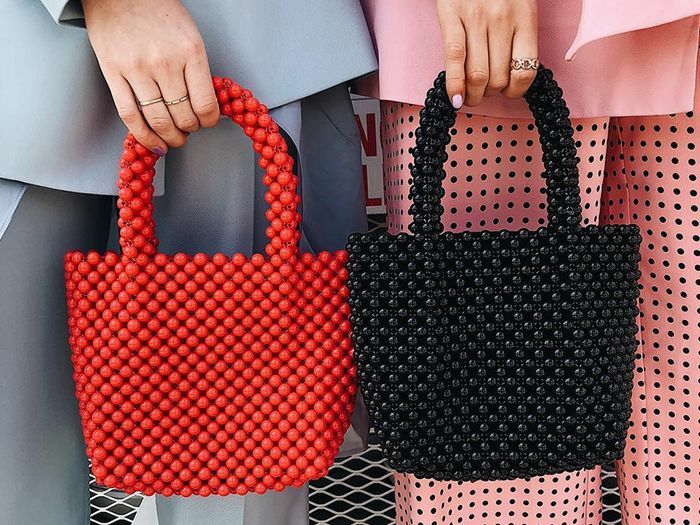 Zara's twin beaded bags were a fan favorite among the Instagram crowd and were honestly just as fun to carry as they were to look at. Zara's version of the PVC shoe trend hit the nail on the head and was obviously quick to sell out. Shoppers snapped these up to get the "Barbie feet" look for a lot less effort. When Zara first dropped its dreamy '80s-inspired party capsule, it cast Italian It girls Gilda Ambrosio and Giorgia Tordini, making us lose our minds. Summer 2018 was definitively the summer of the romantic white top, as nearly every fashion brand released their version of the style. So no surprise Zara's cute crop was an instant hit among the influencer set. Just as soon as we smelled the neon trend emerging, Zara hit us with this ribbed turtleneck in electric green and pink. It wouldn't really be summer if a Zara sundress didn't become a big hit. This year, it hit on so many trendy details: tie straps, button front skirt, and fresh green-and-white checkers. No lie, Zara shoppers drove miles in search of the last in-stock batch of these snake-print boots. Can you even blame them? Zara fans hit up the retailer's affordable swim section before hitting the beach this summer and this printed underwire bikini top (it came with matching bottoms, too) was a clear favorite. Next, see all the items that dominated our Instagram feeds in 2018.